Yet another Tricopter!? Yes! I needed a backup tricopter for a video shoot, so I decided to build one with high quality components, too see if there is any difference in performance. A few weeks ago I’ve made a tricopter basing on your setup and now I see, that you have this same idea as me with the mountage of engines. Take a look at the photos in free-time. Nice work StRess. Did you have those parts machined for you or did you cut them out yourself? Thank you. I cutted them myself, with hacksaw and metal pile. After all, I will have a lot of work yet to match the quality of Davids work. Hi David nice to see new build posts! Could you make a tutorial on your KK2 setup and settings? I think a lot of people use it on your Tricopter 2.5 so it would be great to have a tutorial for both the old and the new HV version. David, why not just use straight suspension wires as the vibrations are in the horizontal plane? I don’t see how bent wires can make a difference unless there are vertical vibrations too. Tried it during the experiment phase but I couldn’t get it to work well with straight wire. The curved wire gives a better vibration dampening as well as is much more stable in the “yaw” twisting plane. The wires get there strenght fron the “straightness”. So by bending them in a curve, you take the ridigness away, and they become more flexible. That’s why they work so much better in a curved shape than as a straight piece. The reason that the bent wires work better is because they are under tension all the time which results in them cancelling out the vibration as well as suspending the tray as it were hard mounted . the loaded spring wire is a lot more rigid than a non loaded wire . Ah.. I didn’t think about the yaw issue. I can imagine that straight wires will cause the tray to lag and oscillate too much during yawing. I’m going to give the wire solution a try. I’m currently using orange bobbins from GetFPV in suspension instead of compression because I have yet to make carbon fibre shapes like this: ? (double mirrored L). 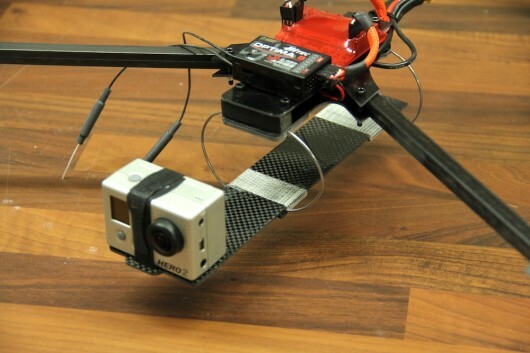 Keep up the good work and I hope to see more of your tricopter experiments on flitetest. P.S. “?” was Unicode character 1DB4. will you post the configurations of kk2?